I'm not sure these are the words of founder Adrian Jones, who has had his share of tribulations, but the music certainly reflects the description. Pushing emotions through Porcupine Tree and Pink Floyd, and feeling, at times, nearly doomish, this is deep and somber music. The reverberations of melancholy begin with the acoustic guitar start of the instrumental Reality Check, only to move into a passage of heavy riffage. Threads follows, and can only be described sorrowful, nearly dark. Acoustic guitar starts Falling to Pieces, and sadness defines it. And so it goes. Loneliness fits the moody title cut, but offers and up tempo conclusion, a striking contrast to the entirety. Thicker Than Water melds all these feelings in a 15 minute melancholic and sorrowful journey. Despite the bleakness of the lyrics and music, Traces remains interesting, but not for the despondent or depressed. Perhaps the most impressive aspect of the album is Adrian Jones guitar work which eerily intones a style similar to David Gilmour much of the time. Nine Stones Close's Traces is interesting, but dark and melancholic, progressive rock, and not for the faint of heart or despondent in soul. 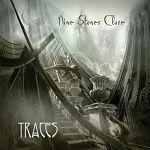 Nine Stones Close's Traces is interesting, but dark and melancholic, progressive rock, and not for the faint of heart.